A man died after Chicago police used a Taser stun gun to subdue him Thursday, just days after a teenager was critically injured in a similar incident that prompted a lawsuit against the city. "It would be extremely premature at this point to attribute either of these incidences directly to the use of the Taser," Police Superintendent Philip Cline said. Police said they used the stun gun when they were unable to restrain an unruly 54-year-old man who was fighting with officers at a high-rise building on the city's North Side Thursday afternoon. The man went into cardiac arrest and later died, according to Chicago Fire Department spokesman Larry Langford. Authorities did not identify the man Thursday evening. Police Cmdr. Michael Chasen said the man was trying to kick and bite officers and threatening to infect them with HIV, the virus that causes AIDS. "'I'm going to kill you with my blood,"' Chasen quoted the man as saying. The death came the same day an official with the Department of Children and Family Services sued the city and a police officer who used a stun gun on a 14-year-old boy on Monday. The boy, who also went into cardiac arrest, remained hospitalized Thursday night. Cline defended the officers' use of the weapons at a news conference but said the department will delay plans to increase its number of stun guns. "We remain confident that the use of Tasers in Chicago has made our streets, our citizens and our police safer," Cline said. In Monday's incident, authorities were called to a group home after the teen injured his hand in a violent outburst. 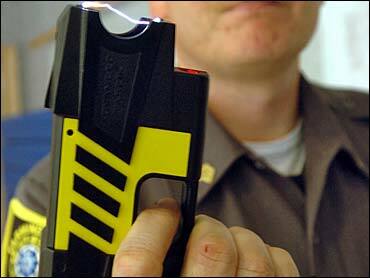 The Taser gun was used after the teen lunged at an officer, police said. But Cook County Public Guardian Robert Harris said reports indicated the boy had already calmed down and was sitting on a couch when police arrived. Jennifer Hoyle, a spokeswoman for the city's law department, said she could not comment on the lawsuit because city officials hadn't had a chance to review it. Harris did not return a call seeking comment Thursday about the lawsuit or the teen's condition. The stun weapons temporarily paralyze people with a 50,000-volt jolt delivered by two barbed darts whose current can penetrate clothing. A study by the Air Force and obtained by CBS News finds that repeated shocks from a Taser stun gun led to heart damage in pigs, reports Correspondent Wyatt Andrews. Specifically, the study examined the pigs' blood and found a jump in the enzyme Troponin T, the body's clearest sign of heart injury. It also found the pigs suffering high levels of blood acid, a potentially life threatening condition called acidosis. "It's a red flag," says Dr. Charles Rackley, a respected cardiologist at Georgetown University Hospital, after he was shown the findings by CBS News. Since 1999, there have been 86 deaths connected to the Taser and one-third of the deaths came from some kind of heart failure. Taser has never been blamed as the leading cause. The Taser corporation declined an on camera interview but released a statement calling the Air Force's 18 shocks "extreme" and claiming the blood tests are similar to what "would be expected (from) strong physical exertion." Taser also notes that the Air Force's researcher called his discovery of the Troponin T heart enzyme statistically insignificant. However, the physicians CBS News contacted call the very existence of troponin T medically significant. The Chicago City Council has voted to look into police alternatives to Taser guns in response to concerns about the stun guns' safety.